Born and raised in Omaha, Kim comes from a musical family. Inspired by her brother, Kim got a guitar at age 11. At 14, she was in a band playing locally for 3 years. 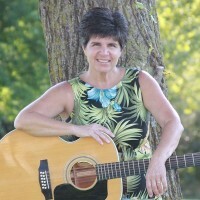 Kim hit the road as a single act playing throughout the Midwest before settling down to play locally and raise a family. Kim did the John Kraft Chevrolet commercials for 16 years. She also did vocals for local and national radio jingles for several years. Kim cut her first CD in Tennessee in 2000. Kim loves a great variety of music. Consequently, she enjoys playing music that ranges from the last seven decades. After singing professionally for 33 years, Kim still loves performing and looks forward to the next 33 years!